Cluster Headaches are one-sided headaches which occur in cyclic patterns or clusters and are marked by the tearing of the eyes and stuffy nose. It is amongst the most agonizing and traumatic types of pain. Such headaches occur at the same time every year and is much more painful if it strikes you at night as compared to the day time. Episodes of pain occur constantly for one week to one year. Who normally get affected by Cluster Headaches? Men are at higher risk of getting affected by Cluster Headaches than women. These headaches can strike at any age but are more likely to occur at adolescent or middle age. These are commonly inherent and are transmitted through genes. What are the symptoms associated with Cluster Headaches? What are the treatments available for Cluster Headaches? Physicians adopt two types of techniques to treat Cluster Headaches viz. Abortive Medications: These medications are prescribed to treat pain when it strikes. Imitrex or some other triptans are prescribed to subside pain when it occurs. At times, oxygen therapy is also administered, where you have to inhale oxygen through face mask. Preventive Medications : These medicines are prescribed by your doctor to minimize the time duration of cluster headaches and to reduce the severity of pain during cluster headaches. How Physical Therapists can help to treat Cluster Headaches? Physical Therapists administer various relaxation techniques to help you to relax the muscles of your neck, jaw and shoulders. Progressive Relaxation techniques are also administered and practiced to relax each and every muscle of your body. Cluster Headaches occur due to stress. Your breathing patterns get disturbed, when you are stressed. So to alter these disrupted breathing patterns, Physical Therapists practice different breathing exercises and make you relieved. These exercises are really advantageous when you are suffering from pain. Exercises that help to alleviate stress are followed. These help to reduce the occurrence ands severity of headaches. These also heighten the level of beta- endorphins which are your natural stress relievers. Contact Alliance Physical Therapy for the efficient management of any type of pain. Timely diagnosis and treatment can save you from further pain and suffering and as well help you to lead a healthy and quality life. Vestibular Rehabilitation Therapy (VRT) is a specific exercise based program that is designed and developed by a professional Physical Therapist to maximize the natural bodily capacities to compensate for the balance disorders and as well to lessen the dizziness related problems. Through Vestibular Rehabilitation Therapy physical therapists treat variety of symptoms related to vestibular disorders viz. Which are the tests conducted under Vestibular Rehabilitation Therapy? What type of exercises is prescribed under Vestibular Rehabilitation Therapy? VOR Stimulation Exercises: This include the exercises which help to stabilize gaze and visual focus as well.During the course, the patient is asked to fix his vision on a set target while moving his or her head. Ocular Motor Exercises: This include a course of exercises, where the patient traces the field with the movement of his eyes only, i.e. without stirring his or her head. Balance Retraining Exercises: This incorporates the set of exercises, which aid to better the co-ordination of muscular responses and structuring of sensory information as well, which in turn results in improved balance control. Canal Re-positioning Maneuvers: These are administered to dislocate the debris with in the affected canal. This debris consists of small crystals of calcium carbonate that get collected with in the canal of inner ear. Aquatic Physiotherapy: It is beneficial for the patients suffering from the problem of chronic dizziness. During the course, all of the exercises are administered in a pool. 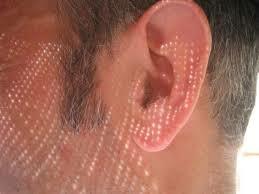 If the patients suffering from vestibular disorders perform their exercises correctly and regularly, in most of the cases the balance problems are improvised ad more over symptoms like muscle tension, dizziness, vertigo, headaches, fatigue begin to diminish or disappear completely with time. Alliance Physical Therapy offers a wide range of support services to the patients. Our trained and qualified physical therapists provide reliable and customized treatment plans as per requirement and condition of the patients and help them to rehabilitate as soon as possible. Knee tends to be the most common joint to be replaced in the human body. People are advised Knee Replacement surgery if, either arthritis, bone diseases and some fracture has deteriorated the joint or if alignment problems have started hindering daily activities like walking, sitting and standing. Physical Therapy techniques after Knee Replacement Surgery help you to heal and resume your routine activities faster. Physical Therapist provides you with rehabilitation services during and after hospitalization. •Administer isometric exercises to prevent blood clotting and to enhance blood circulation. Contact Alliance Physical Therapy for your successful recovery after Knee Replacement and to get back to your feet as soon as possible. We develop a customized treatment plan after collaborating with your consulting surgeon and will help you to rehabilitate quickly. How to cure Plantar Fasciitis? Heel pain is a common complaint that has many causes. Heel pain may result from inflammation of the tissue on the bottom of the foot. This is called plantar fasciitis. The plantar (foot) fascia (connective tissue) stretches under the skin across the arch of the foot from the heel to the base of the toes, when this tissue is tom, overused, or improperly stretched. It can become inflamed (fasciitis) Soreness, tenderness, and palm result. Persons who are overweight, female, or older than 40 years or who spend long hours on their feet are especially at risk of developing plantar fasciitis Athletes, especially joggers and runners, may develop plantar fasciitis. Sometimes plantar fasciitis can be associated with heel spurs. These spurs are outgrowths of bone on the calcaneus (heel bone). They are sometimes painful and may occasionally require surgical treatment. It is important to understand that all heel pain is not from plantar fasciitis. Other medical problems can cause foot and heel pain. Diabetes and blood vessel disease, both serious medical problems, can cause heel pain. Arthritis, traumatic injury and bruising, gout, stress fractures (caused by repeated stress on bone), and other diseases can also cause heel pain. Rarely, tumors (either benign or cancerous) or infections can cause heel pain. If you develop persisting heel pain, see your doctor for an evaluation. 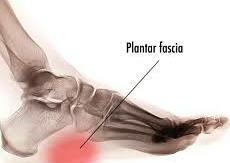 Plantar fasciitis is common in middle-aged people. It also happens in young individuals who are on their legs a lot, like sportsmen or military. It can occur in one feet or both legs. For best treatment of Plantar fasciitis Visit http://www.alliancephysicaltherapyva.com Contact Us at: 703-751-1008. Trigger finger is a condition in which it is difficult to straighten a finger (or fingers) once bent. The medical term for trigger finger is stenosing tenosynovitis. 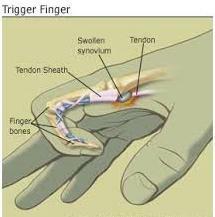 Trigger finger results from inflammation or swelling of the fibrous sheath that encloses the tendons. A tendon is a band of strong fibrous tissue that connects a muscle to a bone. The straightening mechanism hesitates for a few moments before the tendon suddenly overcomes the resistance. The finger then straightens with a sudden jerk or triggering motion. Your health care provider will review your symptoms and examine you. Sometimes it is helped by ice and anti-inflammatory medicine, such as ibuprofen. If this does not work, your health care provider may give you an injection of a local anesthetic to keep you from feeling pain in the area and a corticosteroid to reduce the inflammation of the tendon sheath. If necessary, surgery will be done to remove the part of the tendon sheath that is causing the tendon to get stuck. It is important to follow your health care provider’s instructions. In addition, rest and limit the activity of the affected finger or fingers and of the hand and wrist. Since the cause of trigger finger is unknown, there is no reliable way to prevent this condition from developing. How to cure Foot Pain? Foot pain can affect any part of your foot, from your toes to your Achilles tendon at the back of your heel. Some foot pain is just an annoyance, but foot pain can also be more serious, especially if it’s the result of an injury or certain chronic conditions. Minor foot pain usually responds well to home treatment but more severe foot pain needs medical attention. If not treated, some types of foot pain can lead to long-term damage or disability. Most foot pain is due to poorly fitting shoes, injury or overuse. But structural defects and medical conditions, such as arthritis and diabetes, also can lead to foot problems. Foot pain may be caused by many different conditions or injuries. Acute or repeated injury, disease, or a combination is the most common causes of foot pain. Injury is a result of forces outside the body either directly impacting the body or forcing the body into a position where a single or combination of forces results in damage to the structures of the body. Poor biomechanical alignment may lead to foot pain. Wearing shoes that are too tight or high heels can cause pain at the balls of the feet and the bones in that area. Shoes that are tied too tightly may cause pain and bruising on the top of the foot. Injuries such as ligament sprains, bruises, muscle strains and fractures commonly happen suddenly (acutely). Sprains, strains, bruises, and fractures may be the result of a single or a combination of stresses to the foot. A sprain of the foot or ankle happens when ligaments that hold the bones together are overstretched and their fibers tear. The looseness of ligaments in the joints of the foot may lead to foot pain. The muscle’s bursa and fascia of the foot can be strained by overstretching, overuse, overloading, bruising, or a cut (such as by stepping on a sharp object). Achilles tendonitis is a common injury to the tendon that attaches at the back of the heel. Injury to the bones and joints of the foot can be caused by a single blow or twist to the foot, or also by repetitive injury that can result in a stress fracture. A blunt-force injury such as someone stepping on your foot may result not only in a bruise (contusion) injury but also damage to the muscles and ligaments of the foot. Direct blows to the foot can cause bruising, breaking of the skin, or even fracturing of bones. Metarsalgia is the irritation of the joints of the ball of the foot. “Turf toe” is a common athletic injury in which the tendon under the joint at the base of the big toe is strained. Injury to the toenail can cause pooling of blood under the nail and the permanent or temporary loss of a toenail. Repetitive injury to the bones, muscles, and ligaments can result in extra bone growth known as spurs or exostosis. Pain and point tenderness are the first indications that something is wrong in a specific area. The onset of pain, whether suddenly or over time, is an important indicator of the cause of the problem. Bones of the foot are joined together by ligaments. A sprain happens when the ligaments that hold the bones together are overstretched and the fibers tear. Point tenderness and looseness of a joint are indications of a sprain. Injury to the bones of the foot can be caused by a single blow or twist to the arch or also by repetitive injury that can end in a stress fracture. Fractures are indicated by a small point of pain that may be exquisitely tender on the bone. There may be a noticeable lump or gap at the site of the fracture. A turned toe or forefoot may also be a sign of a fracture. To prevent injuries and pain, the following issues should be addressed before starting an exercise routine. Are you in good health? A general physical exam by a physician will help to evaluate your cardiovascular function, the possibility of disease or any other general medical problems that you may have. Before beginning activities, diseases such as gout, diabetes, certain types of arthritis, and neuropathies should be treated. The area looks deformed, you have loss of function, change of sensation, a large amount of swelling with pain, prolonged change of skin or toenail color, the affected area becomes warmer than the surrounding areas, becomes extremely tender to the touch, or is causing you to move differently. How to Recover from Knee Injuries? The knee joint allows you to run, walk and play sport. Awkward movements, falls and collisions, sudden twists, excessive force or overuse can result in a range of injuries to the knee joint and the structures supporting it. Common knee injuries include ligament, tendon and cartilage tears, and patello-femoral pain syndrome. Stop your activity immediately. Don’t ‘work through’ the pain. Rest the joint at first. Reduce pain, swelling and internal bleeding with icepacks, applied for 15 minutes every couple of hours. Bandage the knee firmly and extend the wrapping down the lower leg. Don’t apply heat to the joint. Avoid alcohol, as this encourages bleeding and swelling. Don’t massage the joint, as this encourages bleeding and swelling. Warm up joints and muscles by gently going through the motions of your sport or activity and stretching muscles. Try to turn on the balls of your feet when you’re changing direction, rather than twisting through your knees. Cool down after exercise by performing light, easy and sustained stretches. Build up an exercise program slowly over time. Aspiration – If the knee joint is grossly swollen, the doctor may release the pressure by drawing off some of the fluid with a fine needle. Physiotherapy – Including ultrasound and electrical muscle stimulation treatment, kneecap taping, exercises for increased mobility and strength, and associated rehabilitation techniques. Arthroscopic surgery or ‘keyhole’ surgery – Where the knee operation is performed by inserting slender instruments through small incisions (cuts). Cartilage tears are often treated with arthroscopic surgery. Open surgery – Required when the injuries are more severe and the entire joint needs to be laid open for repair. What are the Causes of Achilles Tendonitis (Heel Pain)? 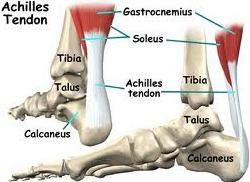 Achilles Tendonitis is inflammation of the Achilles tendon. In most cases, it is a type of overuse injury and is more common in younger people. Professional and weekend athletes can suffer from Achilles tendonitis, but it is also a common overuse injury in people not involved in sport. Treatment includes rest, non-steroidal anti-inflammatory drugs (NSAIDs), physical therapy and avoiding activities that aggravate the condition. Overuse injury –This occurs when the Achilles tendon is stressed until it develops small tears. Runners seem to be the most susceptible. People who play sports that involve jumping, such as basketball, are also at increased risk. Arthritis – Achilles tendonitis can be a part of generalised inflammatory arthritis, such as ankylosing spondylitis or psoriatic arthritis. In these conditions both tendons can be affected. Foot problems – Some people with flat feet or hyperpronated feet (feet that turn inward while walking) are prone to Achilles tendonitis. The flattened arch pulls on calf muscles and keeps the Achilles tendon under tight strain. This constant mechanical stress on the heel and tendon can cause inflammation, pain and swelling of the tendon. Being overweight can make the problem worse. Footwear – Wearing shoes with minimal support while walking or running can increase the risk, as can wearing high heels. Overweight and obesity – Being overweight places more strain on many parts of the body, including the Achilles tendon. Medical history, including your exercise habits and footwear. Physical examination, especially examining for thickness and tenderness of the Achilles tendon. Tests may be required. These may include an x-ray of the foot, ultrasound and occasionally blood tests (to test for an inflammatory condition), and an MRI scan of the tendon. Avoiding or severely limiting activities that may aggravate the condition, such as running. Using shoe inserts (orthoses) to take pressure off the tendon as it heals. In cases of flat or hyperpronated feet, your doctor or podiatrist may recommend long-term use of orthoses. You may also be given specific exercises to gently stretch the calf muscles once the acute stage of inflammation has settled down. Your doctor or physiotherapist will recommend these exercises when you are on the road to recovery. Recovery is often slow and will depend on the severity of the condition and how carefully you follow the treatment and care instructions you are given. How to get Relaxation from Neck Pain? Neck pain can be caused by irregularities in the soft tissues areas, namely in the muscles, ligaments, and nerves. The irregularities can also occur in the bones and joints of the spine. The most common causes of neck pain in the soft-tissue regions are due to injuries, degeneration, or prolonged wear and tear on the muscles and ligaments. In rare cases, infections or tumors may be the cause of neck pain. For some people, neck problems may be the source of pain in the upper back, shoulders, or arms. INFLAMMATORY DISEASES – Rheumatoid arthritis can cause destruction of the joints of the neck. Rheumatoid arthritis typically occurs in the upper neck area. CERVICAL DISK DEGENERATION – The cervical discs act as a shock absorber between the bones in the neck. In cervical disk degeneration, which typically occurs in people age 40 years and older, the normal gelatin-like center of the disk degenerates and the space between the vertebrae narrows. As the disc space becomes narrow, additional stress is placed on the joints of the spine. INJURY – Because the neck has so much flexibility and it must constantly support the head, it is extremely susceptible to injury. Motor vehicle or diving accidents, participation in contact sports, traumatic injuries, or falls may result in neck injuries. The regular use of safety belts in motor vehicles can help to minimize or prevent neck injury. OTHER CAUSES – Tumors, Infections, or Congenital abnormalities of the vertebrae may also cause neck pain and range of motion limitations. Stand with your back to a wall, but not touching the wall. Back yourself up to the wall until something on your body makes contact. Start paying attention to how other people sit while eating or how they tend to carry a large purse or backpack. Does their neck tilt forward against the load or are they using muscles to hold the spine in a healthy position? The average person will overstretch their neck and upper body unequally so often, it is a mystery that they don’t have more pain. Stand with your whole body (heels, hips, upper back, and the back of your head) against a wall. Bring the back of your head against the wall without raising or dropping your chin, or arching your back. If you cannot keep your heels, hips, upper back, and the back of your head against the wall in a comfortable position or you crane your neck, you are too tight to stand up straight. Many people are susceptible to neck and shoulder pain because of repetitive work-related issues, poor posture, and overall bad habits. The things listed below will help you assess your situation and your likely cause of neck and shoulder pain. 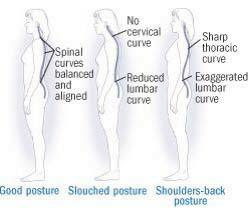 If you are sitting in the same position for long amounts of time you are a prime canditate for neck stiffness and pain. Identify the risks associated with your job and your daily work routine. If you are required to lift heavy objects or are at risk of injury due to a fall or other trauma, you may eventually sustain a more serious injury which causes neck pain. Be certain you take the necessary precautions and safety measures while working. Make an appointment with your doctor for a full check-up annually, especially if you are at increased risk of osteoporosis or congenital problems. Examine your lifestyle for habits that may lead to pain. Pay attention to how you fall asleep, or when you are resting on the couch. Pillows that are very soft or filled with feather or down are likely to cause bad posture during sleep. You should investigate pillows that support the natural curve of your back and neck. Make sure you have suitable furniture in your home. A desk chair that is not supportive or a pillow that doesn’t offer enough neck support will lead to bad posture and result in neck pain. Use relaxation techniques when you are under mental and emotional stress. Stress is a major culprit in bad cases of neck pain. Incorporate the following daily exercises and activities into your day to keep muscles flexible and healthy. Exercising regularly will also reduce tension and stress hormones in your body. Injuries to the cervical spine constitute uncommon but nonetheless devastating occurrences to those participating in athletic events. These injuries happen primarily to athletes involved in the contact sports of football, wrestling, and ice hockey, with football injuries constituting the largest number of cases. The important work of Schneider in the mid 1960s, focusing on football-related head and neck injuries, resulted in a significant reduction in the incidence of these accidents owing to improvements in equipment, education in proper techniques, offseason conditioning, and rule changes. The mechanism of spinal cord injury can be sport related, but it is more commonly independent of the sport. The major mechanism of serious cervical injury is an axial load, or a large compressive force applied to the top of the head. This mechanism is more dangerous when the neck is slightly flexed, because the spine is brought out of its normal lordotic alignment, which does not allow for proper distribution of force to the thorax. Flexion puts the cervical spine in a straight line; thus, the musculature cannot assist in absorbing the force. Torget al indicated that injury occurs to the cervical spine when it is compressed between the body and the rapidly decelerating head. When a fracture results, if the bone fragments or herniated disc materials encroach on the spinal cord, neurologic damage will occur. This mechanism is the primary cause of cervical fracture, dislocation, and quadriplegia. 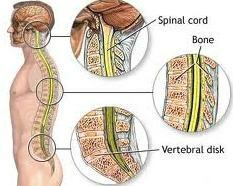 Complete spinal cord injury is a transverse myelopathy with total loss of spinal function below the level of the lesion. This insult is caused by either anatomic disruption of the spinal cord or, more commonly, hemorrhagic or ischemic damage at the site of injury. Although the spinal cord usually remains in continuity, a physiologic block to impulse transmission results in the complete injury. Complete injury patterns are rarely reversible, although with long-term follow-up, improvement of 1 spinal level may be seen when the initial segmental traumatic spinal cord swelling resolves. Several patterns of incomplete spinal cord injury are common, usually produced on a vascular basis. The central cord syndrome causes incomplete loss of motor function with a disproportionate weakness of the upper extremities as compared with the lower extremities. This condition is thought to be the result of hemorrhagic and ischemic injury to the corticospinal tracts because of their somatotopic arrangement. Fibers of cervical nerves that innervate the upper extremities are arranged more medially than those subserving function to the lower extremities. The originally described central cord syndrome also includes nonspecific sensory loss and bladder and sexual dysfunction. This injury pattern is also often seen in older patients with vertebral osteophytes and in those with hyper-extension injuries.